Here is How To Earn $3.43 For Every $1 You Spend On Advertising! "How Fast Do You Think Your Online Business And Cash Flow Would Grow If You Could Wake Up Every Morning, Push A Button, And In Just A Few Minutes Discover Exactly What You Need To Do That Day To Increase Your Traffic And Sales?" Are you ready to take control of your marketing efforts, and create a predictable system for making money? Are you ready to stop wasting time and money on marketing that isn't producing the results you want? Are you ready to start directing your online business to where you want it to go, instead of leaving your ability to create money completely to chance? Download Ad-Trackz Today and Claim Your Hidden Profits! Enhanced Pay-Per-Click Keyword Tracking means you can set up and track conversions on hundreds of keywords in minutes! Smart Cloaking Technology allows you to protect all of your affiliate links from commission hijackers! Track Conversions on your website and on affiliate or partner websites that you don't control! Track, Edit and Manage hundreds of your promotional campaigns with ease! Track Your R.O.I. from offline promotions, online promotions, and everything in between! Double Your Conversion Rate with the built-in, easy-to-use a/b split testing system. Read This Letter Now to Discover The Answer to All of Your Ad Tracking Problems! and some marketers know that their ad campaign will produce $3.43 for every $1 they spend. They'd bet a million dollars on the fact that if they take a certain action, then they will make x amount of money. Imagine being that confident in your marketing. To know with certainty the results of all your advertising. It's like having a license to print money because when you need cash, you can just re-run one of your winning campaigns! Ad-Trackz can give you this kind of security. Online advertisers could save hundreds to thousands of dollars a year in wasted advertising money if they just TRACKED their ad campaigns. Ad-Trackz is an affordable solution that over-delivers in every way possible. The ability to track actions on affiliate websites is powerful bonus that I've not seen with any other tracking program. Plus, the fact that Ad-Trackz offers user-friendly website split-testing, URL shortening, affiliate link cloaking and a handy URL rotator makes this program stand in a league of its own among professional ad tracking solutions." "After having tested your software versus three other packages, yours is our BEST PICK"
Why Struggle When You Don't Have To? Internet Marketing is tough. Especially for the new marketer. Day after day you get hit with pitches for ebooks and marketing products, all designed to teach you the latest greatest internet marketing tip or trick. So you read this report and listen to that teleconference call. You try a strategy or trick, maybe you get some good results, maybe you don't. But even if you do make money, it's not consistent or predictable. You want a systematic way of creating income on demand. You want to sleep at night without worrying where you're next sale is coming from! That kind of security comes from one thing and one thing only: to track and record every advertising action you take, and focus on those that bring results. Ad-Trackz let's you see where all your traffic is coming from, and then automatically analyzes the return of investment of those sources so you can focus your time on campaigns that make money, and drop those that don't. Click on the thumbnail below for a full screen view of the type of statistics report you can have access to if you purchase Ad-Trackz today. Tracks which keyword generates the sale in google adwords, overture, or any major ppc engine. Groups your campaigns by website, type of ad, purpose of campaign, or anything you want--you can easily customize everything so you'll be able to get the exact information you want fast! Ability to shorten tracking URLS, and make them look like just another page on your web site (so people won't even know they're being tracked). Do Any Of The Following? Up until now, you were forced to rely on your affiliate program's stats program to track your sales. Yes, they tell you your total clicks and your total sales, but they don't let you know WHERE those clicks and sales come from. And there was no way to track that using an ad tracker. 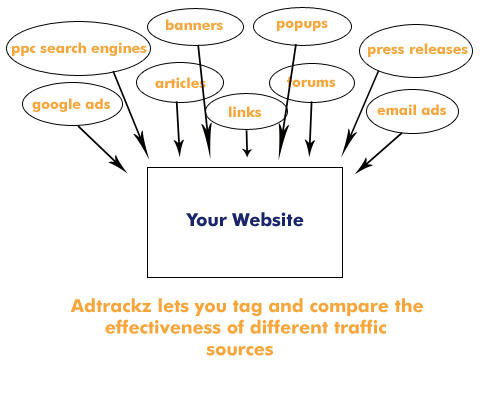 But with Ad-Trackz, you can track which of your traffic sources are producing sales for any affiliate program. No other script that you install on your server can actually tell you which of your ads are generating affiliate sales! The affiliate program owner only has to install one line of code on their thank you page, and ALL Ad-Trackz users can track their affiliate sales with that program. The great thing is that this even works with mlm programs you might be promoting. If you're part of a downline club, or you're trying to get people to join free, you can still get whoever is in charge to insert that one tiny line of code, and you'll be able to determine the effectiveness of your campaigns. It's a win-win situation because they get an affiliate who is only going to improve their advertising, and you get to track your sales. How cool is that? Please don't be fooled! Some of our competitors (who charge monthly), don't require you to install code on the merchant's thank you page. Instead, they use frames to do their remote tracking. This would be a great solution, except most affiliate programs (including clickbank) actually break out of frames. How good is a feature to you if it only works for half of your affiliate programs? The Ad-Trackz can convert all your existing keyword campaigns into tracking urls automatically, just by filling out a form. The whole process takes just 5-10 minutes - even if you have thousands of keywords. With other software, if you wanted to label a new traffic source, you had to open a new browser window, log into your ad tracker, fill out a form, then write down the url it generates. Now you can just create the label for the traffic source on the fly and be done with it. Ad-Trackz automatically creates the campaign for you and starts tracking how many clicks, sales and actions it generates, just like any other campaign. This is very useful for placing ezine ads, or tracking forum posts on the fly. It's also one of the reasons why you can set up Ad-Trackz to mass track hundreds of keywords in 5 minutes. When you advertise your affiliate program with your naked affiliate ID you are at risk of losing your commissions. People sometimes strip the ID off the end of the url, either to buy directly from the owner, or to replace your code with their own so they can order from themselves and get a commission! Some specialized scripts were created to protect your affiliate links and they cost as much as $59! Well save your cash because with Ad-Trackz's not only do you get built in link protection, but you get double the protection those other solutions can promise you. The problem is, even if you hide your url behind a simple html redirection, or even, an encrypted redirection, some affiliate programs STILL show your ID on the landing page. But not so with Ad-Trackz, your affiliate ID is completely hidden from the visitor. When a visitor clicks on the cloaked url that Ad-Trackz generates, they are redirected behind the scenes, using special technology to your affiliate link. The affiliate link sets the cookie, tagging your visitor with your id, then adtrackz sends your visitor directly to the main affiliate website. There's no chance for the visitor to strip your code because they will never see it. People have reported doubling their affiliate sales simply by using a cloaker. You get it free with Ad-Trackz. By filling out a simple form! Split testing is a guaranteed way to increase the conversion rate of your website. In a split test, you divide the traffic equally amongst two versions of your salesletter to see which version produces the most sales. Imagine if you are making $1000/week, and you change your headline and double your conversion rate. Your traffic stays the same, the amount of work you put into your business stays the same, but somehow, you are now making $2000/week! It's almost like free money. And the only way you can discover these things is by testing every little thing. With Ad-Trackz, the process is extremely simple. Check your stats in the exclusive section dedicated to split tests and you'll see one campaign's conversion rate and R.O.I stacked up against the other, you'll know right away which salesletter is pulling. If you perform split tests regularly, there is no limit to how many more sales you can pull from your existing traffic, without doing any extra work. In the statistics report there are a total of 13 columns that you can choose to display. You're not constrained to see any set number of stats, you can see them all, or only a few. You have the choice. What it means is you'll have a tool that will automatically collect all the information you need to begin making the right moves in your marketing--giving you the ability to constantly improve every area of your sales process, from traffic generation to converting that traffic into sales. Information is going to be presented to you in a way that you'll quickly and easily be able to understand. You can make informed decisions on how to move your marketing forward and improve it to make more money. It means you can start, from this day forward, to reap the rewards of a massive internet empire on the advertising track record you start building today. And most importantly It means you can relax and have more stability in your life, because you're working with real numbers and dependable results, not guesswork and the latest "tactics". By ordering Ad-Trackz today, you can save hundreds of real dollars. Let's say you are running a pay per click campaign with 5 keywords in total. On the whole, your 5 keywords might be making a profit, of let's say, $1000/month. But what if you started to track each individual keyword's performance. You might discover that 2 of your keywords are actually losing money. Right now, your profit is $1000/month. You're spending $1740 and getting $2840 back. 2) Even though you now save an extra $980 in advertising costs, you still profit more, by another $650! Because you are no longing losing money on those campaigns. So instead of spending $1740 to earn $2840 in revenues, you'll spend $760 and earn $2410 in revenue! This same kind of phenomena will work with all of your advertising, ezine ads, banner ads, newsletters, your offline advertising, or anything else! That's how much money you are possibly losing right now, the more you are not accurately tracking what you do online. So the question is, how much is this software worth to you? You can certainly buy more advertising, but if your advertising is not optimized, as above, you might as well burn that $500. ...so that a small initial outlay can turn into a huge profit later on. You could easily spend $197 for Ad-Trackz and it would be more than profitable for you. Just think of how much more money you can make when you know for certain that x action will earn you $3.43 for every $1 you spend. If you could buy a magic pill that guarantees future advertising profit, how much would you pay? That's what you're getting here. But since I can sell each copy of Ad-Trackz in bulk without having to bother with shipping costs or delivery (don't you love the internet?) I have come up with a much better price for Ad-Trackz for you. It's just $97 $67 for a limited time. This price may or may not go up depending on the results of my marketing tests, so the time to buy is right now. I feel as if you've created this script just for me! I've been searching for a script like this for months - I would have paid at least $20 a month just to use it. Ad-Trackz is definitely a cut above the rest. I've tested nearly every script and service and I can safely say your's is hands down the best ad-tracker on the market! I particularly like the split-testing feature, and being able to track actions and sales for the affiliate programs I'm promoting. I know this script will definitely pay for itself over and over again. "This is without a doubt the best ad tracking software I've ever used! Ad-Trackz really works great, I'm VERY impressed! I've actually used many different ad trackers, but quit using them because they didn't go nearly as in depth with statistics as Ad-Trackz does. All of the other ad tracking software still left me wondering 'how are my ads performing? ', but with Ad-Trackz, I know exactly how they're performing. This was without a doubt a great investment for my business and it's already paid for itself many times over! Congratulations on a great product , I know it will do great :o)"
Thank you for the upgrade, everything went smoothly. This is now even more impressive and powerful. I am glad I made my purchase. Finally An Ad Tracking Program works! I have been searching for an ad tracking program for 6 months! program even caused my web page to come up extremely slow! Then I tried Ad-Trackz! The program works just as described and the customer service was outstanding. 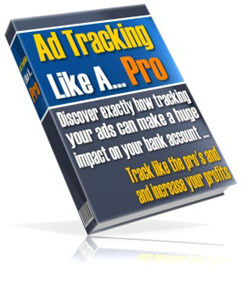 Ad-Trackz is without a doubt THE BEST ad tracking software on the market today! This is a GREAT product. I'm already making serious decisions based on the statistics. Thanks again. The program is great so far by the way, suits my needs perfectly. A quick note to let you know Luisa and I have been using ad-trackz for a few weeks now, and I am happy that we took the plunge to get your product. We have found it to be an excellent tool to pinpoint what campaigns are effective and which ones are not, so now we can quickly make adjustments and fine tune the advertising efforts. The fact that you charge a one time fee, rather than the typical recurring monthly fee makes it MUCH more attractive, and affordable, and pays for itself in no time! We also love the fact that we have complete control of the software since it runs independently on our website. This also gives the added benefit of using our OWN domain name in our tracking links, instead of someone else's, giving our name more exposure, as it should! After spending quite some time comparing tracking solutions for my internet marketing efforts, I have to say that I am very impressed with Ad-Trackz and your dedication to making sure your customers are happy. Not only did it meet my needs of a script that I could run on my own server (for performance and cost issues) but you completely overdeliver on the features and my expectations for adding new ones. You can bet I will be a loyal evangelist to anyone needing a professional tracking system. How Much Longer Do You Want To Keep Taking Shots In The Dark With Your Marketing, And Keep Getting The Same Uncontrolled Results? Then take control! Start being the boss of your marketing efforts, and demand the results you deserve. Start marketing your products intelligently, instead of leaving it all to chance. It's easy. Just click the link below and you'll be taken to our 100% secure order page where you can pay by credit card or online check. You'll see our pricing options and special packages. Once your order has been received, you'll get instant access to the download area where you'll find the Ad-Trackz software and instructions on how to install it (or how to have us install it for you). Tomorrow morning you could be waking up to valuable marketing intelligence you can use to increase traffic and sales, don't make another move in your marketing without getting your hands on that information first! The ebook will teach any new or advanced marketer how to setup their marketing so they can track nearly everything. Within this ebook you will discover exactly how tracking your ads can make a huge impact on your bank account. Yes, David! Please Allow Me To Download Ad-Trackz Right Away So I Can Take The Guesswork Out Of My Advertising! I want to create consistent and secure income streams for my business and exploit the massive income potential that comes with tracking and analyzing all my traffic sources. I understand that I'll get full access to download Ad-trackz immediately after my order is processed. I understand that I get to try it out for a full 60 days. If I am not satisfied in anyway, I can return it for a prompt refund. I understand that as part of my license, I can install Ad-Trackz on up to 5 of my own personal domains, so long as I am the sole user of each instance of the software. I also understand that I can purchase additional domain licenses if needed. In plain english, basically, if you are not running on a windows server chances are you can run Adtrackz. If you're still not sure, copy and paste the requirements and send them to your website's support center. They'll let you know. And, of course, if Adtrackz doesn't work on your website for whatever reason, we'll refund you no questions asked. P.S. Order Now and start creating the results you want from your marketing. Remember that you risk nothing in giving it a try...if it's not everything you hoped for, you don't have to pay a single penny! P.P.S. Also, remember that you must take action soon if you want the lifetime license. Don't let yourself miss out on this golden opportunity to get everything you need in one easy package to start tracking your advertising and improving your marketing - for life.